All you need is an awesome drummer playing an awesome kit that has been perfectly tuned in an amazing room carefully mic'd (in terms of positioning) with some carefully chosen and awesome microphones going through world class preamps and pristine converters into your DAW/onto tape. Those drums will then be processed appropriately using awesome gear and will play their part into a well arranged mixed and produced awesome song. Easy eh? Let's take that one step at a time shall we. 2. Awesome kit. You either have access to one or you don't (again happy to help subject to you crossing my palm with silver ;-) ). My tools of choice for great rock drums are my DW custom drums with Zildjian A Custom cymbals. I also keep a choice of snare drums in house. If you have a drummer he'll have his own preference. The general rule for bottom heads is keep it 1 ply and as thin as possible. it's hard to beat the Remo Power Stroke 3. It comes with a Kevlar patch for the beater. That head will last for years . Buy one and forget about it.....oh yeah, it sounds great too! I really like the Remo Coated Emperor. It is my hands down favorite for recording. It is a 2 ply coated head, so it helps keep down just enough of the ring without choking the response or taking away the "crack". 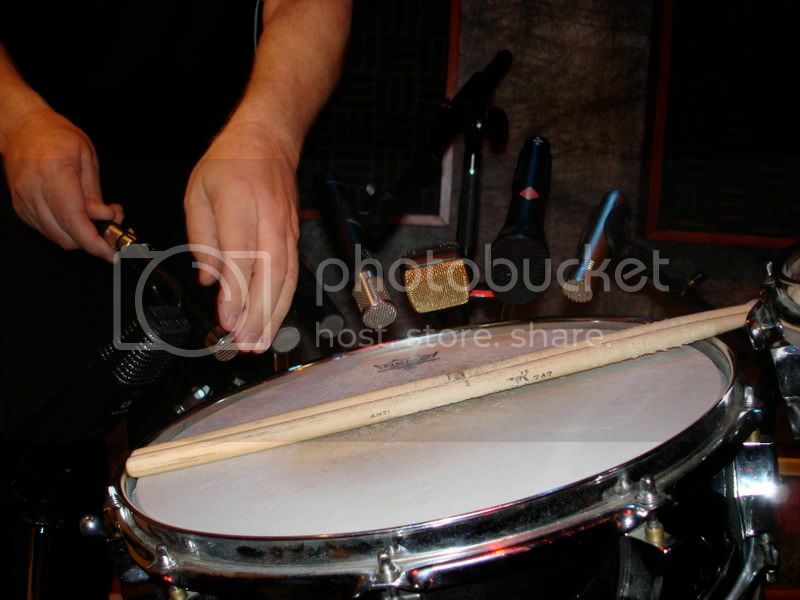 Keep in mind, the drummer has to hit the snare dead center to get a great snare sound....and super hard! Another thing you might consider....smaller toms are easier to tune, so sometimes you will see G1's on the smaller toms, but then after the 14" tom, you can put on G2's to help with the overtones. The G1 and G2 heads work well together because they have similar sound qualities. You generally would not want to mix tom heads, but this is one of few exceptions. 4. Awesome acoustic space. Now I understand that you aren't all going to have either Air Lynhurst or the big-room at Circle Studios but it's the room sound is what most lets home recordists down when it comes to recording drums. There is however a lot you can do to improve what you have using baffles and gobos and the like (a bag of 6 slabs of rigid rockwool costs about £40 at Wickes and, along with a couple of carefully placed duvets, will do a lot to keep out the sound of a nasty room without costing the earth). If your budget won't stretch to something like this it helps even to poke your overheads through a square of foam so the reflections from your low ceiling don't bounce right back into your mics. Beware that both of these approaches are likely to colour the sound your overheads pick up to some degree but they can make a significant improvement in a room with poor acoustics. Room mics are trickier (as they are designed to capture the room sound duh!) but you might experiment with a tunnel using rockwool/foam/duvet or a combination to keep out the worst effects of the room. HOT TIP: A really great tip (IMO of course) concerns how to find the best place in the room to put the drums. If, say, the snare drum is the most important one in that song or for the type of music you do (if it's the kick in your case then use the kick) walk around the room hitting the snare drum. You'll notice as you walk around that it sounds different in different places. Where it sounds the best (you guessed it) set upp the rest of the kit around it. That way you are making the most out of the particular acoustic space you are tracking in! Just starting out and need to buy some mics? Tell you what, I'll set out some studio staples and then I'll tell you what I do differently and why. Of course it will depend on every occasion on the vibe you are going for. Kick: People like all sorts of things on kick. The three probably most used are AKG D112, Shure Beta 52, Audix D6. Personally for a modern rock thing I often use the Shure Beta 91 inside ((awesome click) and the Yamaha Subkick (outside). I also love what a vintage D12 will do. There are a huge number of options on this though an excellent one if you have the cash is a combination of Sennheiser MD421 (click) & Neumann U47 FET (thump). Interestingly Crowley and Tripp have just introduced the El Diablo which is a ribbon mic (you heard right) that takes enormous SPLs and can even go inside a kick drum. I was lucky enough to get to play with a pre-production one last year and can report that it does the 421/47fet thing impressively well. Snare: most ubiquitous here is the SM57 on top: http://www.dv247.com/invt/13247/ Personally, I don't like it as I find it a bit nasallly. Others like the MD421. The Neumann KM84 is a great choice but is expensive. Again experimentation is the key. I couldn't find what I was looking for with only one mic so, after a lot of experimenation, I've found my favourite to be a combination of a Beyerdynamic MC201 and the Oktava 219: http://www.dv247.com/invt/8673/. By contrast Steve Albini couldn't find what he was looking for so went out and had Josephson make a mic for him especially for snare (the e22s). Toms: the Sennheiser MD421 and 604s are pretty ubiquitous here. The Shure Beta 98d might make an appearance for some. Other stick with their trusty SM57. Again, experiment, YMMV. I tend to use 604s on rack toms and 421s on floor unless I have a decent budget at which point I'll hire in Josephson e22s. Overheads: There's a huge range available here at all osrts of price points. Generally speaking Small Diaphragm Condensers (SDC) are the weapon of choice as they don't colour the sound as much though both LDCs and ribbons occasionally get a look in precisely because they colour the sound! SDCs: at the high end the Neumann KM84 is a studio staple though it's now out of production. It's replacement is the KM184 (though to be fair it is not liked nearly as widely by the pro-community): http://www.dv247.com/invt/43392/ A decent budget alternative that is very useable is the Shure SM81: http://www.dv247.com/invt/28758/. I have a pair of KM-69 from Mercenary Audio but,a gain, the Josephson e22s will often get a look in. LDCs. At the high end the AKG C12 has appeared on many hit records. It's no longer in production and is expensive. There are a number of clones such as the Peluso P12 which is great bang for buck. Room mics can vary from U47 fets through ribbons, and pzms. I love the sound I get from the built in mic on my macbook. It provides this awesome compressed distorted sound that makes your drums sound huge in the chorus. Suffice is to say that trial and error is the key to getting this right. An inch can make a huge difference between an awesome crack and a damp squib. If you haven't got an assistant then put on a pair of cans and as the drummer hits each drum in turn tweak the mic positioning until it sounds as good as it possible can. Keep a close eye on phase coherency as you set mics up (if for example you are mic-ing top and bottom snare you may well find that you have to flip the phase on one of them). It's easier to fix it at this stage than trying to sort out phase hell in the mix! If you have a pair of mics then as set out in the link above your choices might include 'Spaced Pair', 'X/Y' or Blumlein, ( X-Y and Blumlein Stereo Recording ) 'ORTF', ( ORTF Stereo Recording ) or 'Mid-side' ( Mid-Side Stereo Recording ). If for you the kick drum just can't sound big enough I thoroughly recommend the Germ with the aptly named 'thick' button engaged (I used this paired with a yamaha subkick outside for a huge kick in the chest kind of thump). Other preamps known for their thick creamy character include pretty much anything older from Rupert Neve (I'd exclude the portico series from this), Great River MP2NV, Groove Tubes vipre. Inside: I like to use something a bit cleaner to pair with the mic inside the kick drum to capture the 'click'. while I use my API console, the RNP is a great bang for buck option for this duty. I've also used a GML, a DAV BG1 and even a Joemeek OneQ ( http://www.dv247.com/invt/20658/ ) to good effect on this. As I said on mics I like to pair an Oktava 219 with a Beyer 201 on snare. I then adjust the balance to fit the song. With the Beyer I like to really slam the input of the pre to distortion point and to exaggerate the depth of the crack. If I don't use the API, which is invariably first choice, the Great River may get this duty though the Vipre does a great job on this too. The Oktava may get either Great River or another API channel depending on the tone I'm shooting for. They say that all other things being equal, upgrading your converters should probably the last thing you think about. I'd agree. That said, if the rest of your input chain is good converters will take you that extra few percent (though it tends to be a very expensive few percent indeed). At the other end of the scale if you are using converters on an unboard soundcard you may hear a huge difference in just upgrading to a box designed for audio recording (onboard sound cards are just not up to the job at all.) Obviously different pricepoints will suggest different choices so it depends on your budget. There are a few gems to consider at each level though. Some of the ones I set out below I've heard good things (for which read hearsay) about. I've tried many at the higher end. The above range from about a grand to about 20 grand. Is that last one percent worth 18 grand to you? Only you can decide. For my money, in bang for buck terms, the Lynx was my choice. If money was no object would I have a Burl Mothership or a Radar system... ? 9. Should I compress or EQ while tracking? That depends. If you haven't got great outboard EQs or compressors, I'd say no. You can't undo effects you actually apply during tracking. To be frank most budget processors and channel strips do not have pleasant compressors/EQs. What if you do have some high end gear? Well, then it's a matter of taste and engineers differ widely on this subject. My view is that with careful tuning/mic positioning etc you shouldn't need to EQ at this stage and, in this 24bit digital world, there is no need to compress on the way in because if something needs a bit of compression later, and providing you have tracked at appropriate levels (more on this later), you'll have ample headroom to process later. There's absolutely no doubt that there are a large number of very experienced engineers out there who are only interested in tracking drums to tape. There's equally no doubt that tape can add a certain je ne sais quois to the sound. Personally (and I'm probably in a minority on this) I don't actually like what tape does to transients, especially on snare drums. Sure it makes them big, roomy etc but I'm not sure the trade off is worth it. As ever, YMMV! HOT TIP. While you are still tracking take a mult from your snare drum and run it through a transient designer (if you can get your hands on one). Shave of the tail of the snare so all you are left with is the pop of the attack. You can then use it to help you out with the tricks below. 11. My snare sound puny. How can I improve it? Okay. This is pretty common. Happily there's a bunch of things you can try. Very often (if you've followed the advice above and worked hard on your mic positioning) the problem will be phase related. First off mute everything but the snare drum. How does it sound? Better? Okay now introduce the overheads. Did the snare get 'thinner'? Flip the phase on the snare and see what happens. Introduce each mic in turn flipping the phase on each as you do so until you find the best overall balance. You may find that applying strip silence (if you are a PT user, if not your gonna have to hand edit the crap) between tom and kick hits improves phase coherence vis-a-vis others. Still not working? It's proably a tracking problem. 12. Anything else I can do? 13. My kit sounds good but it lacks punch. Okay let's talk about parallel compression. If you haven't tried this before, this is going to blow you away... Also known as the "New York Parallel Compression Trick". Essnetially all that you do here is mult your kit so the kick, snare and toms all go to a bus with compression set to stun and then on to your mixbus in addition to going direct to your mixbus. What this does its it provides the weight and depth of the compressed track but retains the transient content of a clean track. Mix them back together to taste (usually with the squished track sitting behind the clean track). HOT TIP: If you are using plugins rather than hardware try stacking three compressors one after another each knocking off 2-3db rather than just one set to kill. You'll achieve more transparent compression with less artifacts. ANOTHER HOT TIP: If you are using UAD compressors on the parallel bus instead of sending the clean drums direct to the mixbus send it to an auxbus running nother but a delaycomp plugin set to the same latency as the plugins you use. That's enough for today. Watch this space for more! Thanks man. Worthy of a sticky? I have a busy weekend coming up but will try and get it finished asap. Great post Trev. You're spot on about some drummers not knowing how to tune their drums... had a drummer in our band many (well over 10) years ago who had a very nice Pearl DLX kit who was most put out that despite him adding every damping gizmo in the world on it, it still didn't sound as good as my properly tuned and reworked Hohner LE kit (with the LE kit I had simply removed the awful plastic wrap from all the shells, re-sanded and waxed the bearing edges then simply stained and polished the wood shells and refitted the hoops with some new Remo pinstripes). Once I tuned his own kit for him and removed all the damper rubbish he was a much happier camper! Aside from the usual gaffer tape for taming odd skin resonances, I also find the trick of slightly detuning one tension lugs works and more recently I really like using Moon Gel too - does DV sell Moon Gel??? Not sure if they do but a cheap yet awesome alternative (sorry DV) is to get one of those wrist rests for computer keyboards and chop it into little slivers. It's exactly the same stuff! Years ago when I was somewhat less experienced I was setting up a kit for a gig at a big club. The rest of the crew was gone at lunch (I was the cable monkey, for those who know the industry terminology) so I was on my own. Problem was, I had no real idea what a drum kit was supposed to sound like, so when I struck a tom with a stick and got a big attack and huge tone (which is *exactly* how it was supposed to sound), I thought, "Wow. Have to do something about that!". There was no such thing as moon gel back then, so I cast about looking for solutions. There it was. A box of...er..."feminine products". Perfect. Sticky on one side and absorbent, just what I needed. I stuck them to the toms, the snare and inside the kick, then struck them with the stick again. Dead as the proverbial door nail. Awesome. A couple of hours later I was sitting back behind FOH and overheard a conversation between the drum tech and the FOH engineer, who was asking how load in went. The DT responded, "Yeah, great...except some %#^&er stuck a bunch of maxi pads all over the drum kit, which wouldn't come off clean, so we had to repace all the heads and re-tune the kit..."
Appropos of nothing...just thought I'd share. 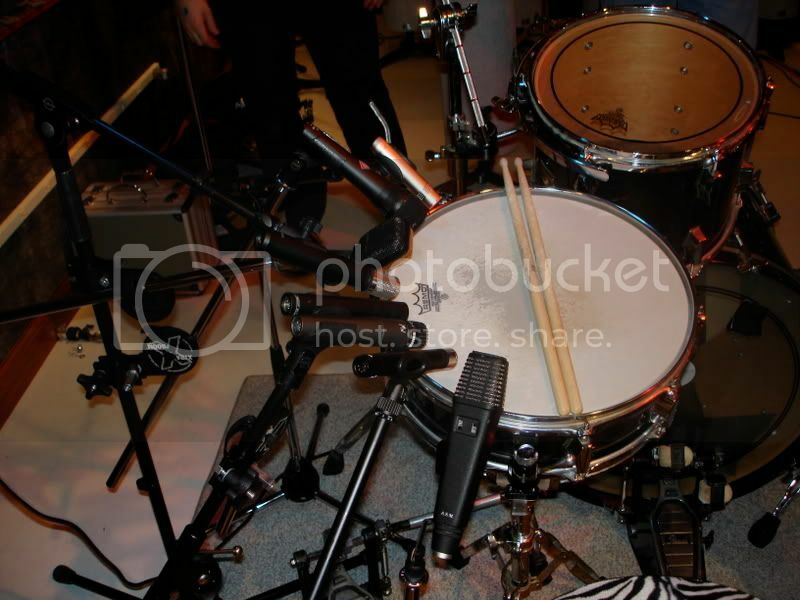 But did he at least play the kit with the "pads" first?? No. Turns out the drum tech had already changed the heads and tuned the kit earlier in the day. I heard him doing it, but I was so green I just thought he was, I don't know, playing the kit for fun or something. And this was a BIG band in the 80's, with a drummer who definitely knew exactly what he wanted, and would have been...pissed...if he'd walked out to play a kit with maxi pads pasted all over it. You know, this might be the start of a thread on "Most Embarrasing Audio Gaffs" or something. more material added together with a 'hot tip' or two. This post keeps getting better and better. Thanks for sharing your wisdom, Trev! Very useful info. more stuff on mic placement, tracking levels and converters added to original post. You got some kind of fetish going there? That's just weird dude.